Is knitting becoming popular again? So haven’t really posted anything new about my learning project in a long time. Not that I was super busy with midterm assignments being due, but because I have run into a lull. I have found a knitting community that shares patterns and ideas to help beginners. I have started and stopped and restarted projects. My next step will be to produce an instructional video that will help with learning to knit left handed. But I need someone to hold the camera for me. However, with all these set backs I have looked into whether or not knitting is becoming popular again. I posed this question onto Google and found an article that states that knitting becomes more popular when the season changes and if celebrities are doing it. This just makes sense, in winter many people spend more time at home and knitting is just easy to pick up. I also have had discussions about knitting with many people and they say that they knit to relax. I am also finding this to be true. At night, when I’m ready to relax on the couch I pick up my knitting turn on a relaxing tv show and just knit. It is almost blissful. 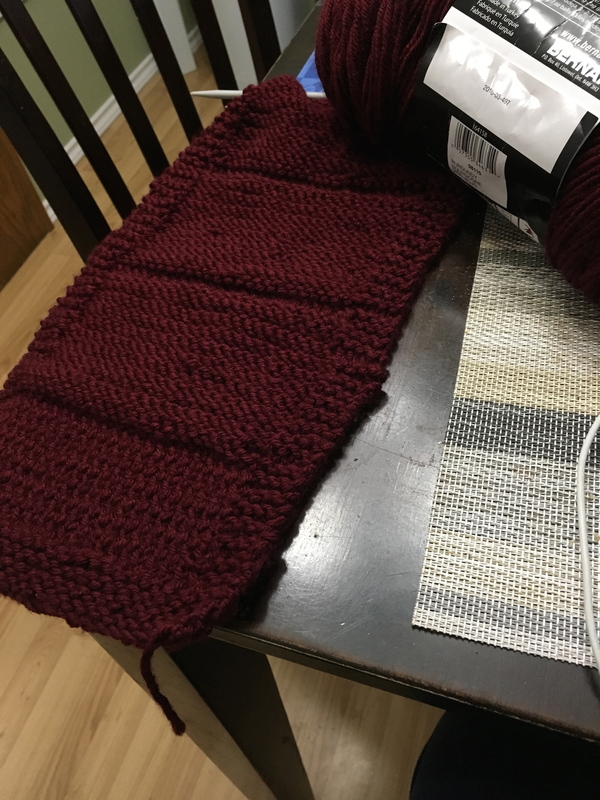 My project that I am working on right now is a scarf. I have made a ton of mistakes but I am learning to let that go and just keep on going. I found the pattern for this scarf on Ravelry. Let me know how I’m doing, or how should I get out of my knitting lull. Any productive suggestions will be considered. Hi Chelsey, I am not able to give any suggestions as to knitting as I no nothing about it, however I am very intrigued with your idea of creating a instructional video that demonstrates how left handed people knit. As a fellow left-handed person, I know that many times when watching videos, it can be extremely frustrating to see how people do a task right handed. I tend to give up, as it is too difficult to figure out exactly how you are supposed to do it, essentially opposite. So although I do not have any tips on how to get out of your knitting lull, I thought I would just share how excited I was that you will be making a left handed video (the world needs more of these :))!!! Thanks Christina, I hope to have my video up in the next couple of weeks.